Alley in Mumbai, India has been submitted to ‘Not Just A Face’ on National Geographic. Kristian Bertel has contributed to the National Geographic Your Shot community with an assignment called ‘Not Just A Face‘. For this assignment curated by Maggie Steber, a photographer at National Geographic is stating that our lives are written across our faces and that is why the portrait is so important. And with this assignment it is our chance to capture not only the face, but the whole story of a person. It is about Portraiture and especially about seeing past the face to get to a person’s larger story. It is about finding the true self and we should not settle for a studio portrait like we see hanging in everyone’s homes. We should rather go beyond the face and make portraits of hands, feet, hair, clothing, anything that can someone can use to express themselves. We can put photographs together to create the layers of someone or our lives. Where we should try to show Maggie something she has not seen before and we should remember that portraits are more than just a face and then tell National Geographic the whole story. As Maggie is saying it: ”- For this assignment, I encourage you to go out of your comfort zone and learn to listen and collaborate with someone, going beyond the headshot and instead finding a deeper depiction of someone. I love collaborating with a subject because they can tell you a heck of a lot more about themselves! Sometimes I found they had better ideas than I did. Think about photographing people in their private spaces as their homes, bedrooms, kitchens or studios, inside their cars or their gardens. Pose them with things or people or animals that mean something to them. You can try to make a portrait that also speaks to memory, to the past, to the future, how people see themselves or the in-between moments”, she says. As a traveler it can be seen in India‘s cultural view of elderly care, where the parents typically are cared for by their children into old age, most commonly by their sons. In these countries, elderly citizens, especially men, are viewed in very high regard. Traditional values demand honor and respect for older, wiser people. India is facing the same problem as many developing nations in that its elderly population is increasing tremendously, with a current estimate of 90 million over the age of sixty. A basic mark of old age that affects both body and mind is “slowness of behavior”. This “slowing down principle” finds a correlation between advancing age and slowness of reaction and physical and mental task performance. 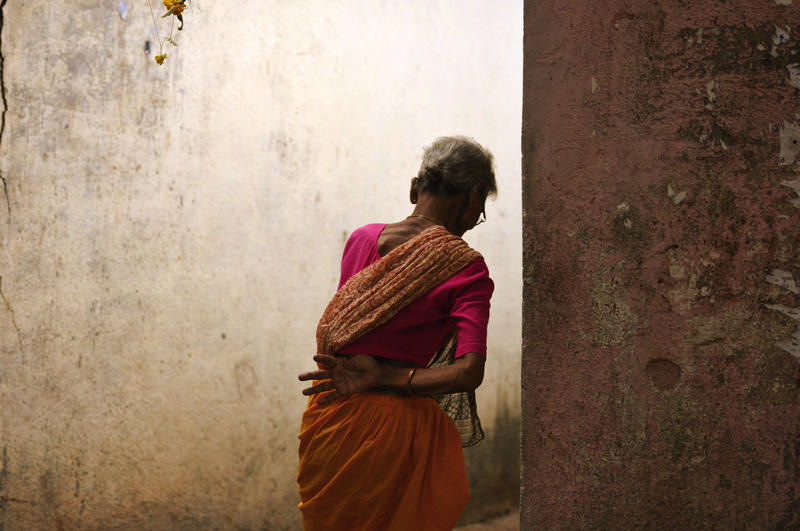 ”- Old age is beautifully portrayed as this woman was passing through an alley in Mumbai, Maharashtra, India”, the photographer Kristian Bertel says.